Endodontic treatments procedure involves removal of damaged pulp and related debris inside the tooth, cleaning, disinfection and shaping of the inner canals beneath the tooth. Once the tooth is thoroughly cleaned, it is sealed. The final step may involve further restoration of the tooth and in most cases, an artificial tooth crown made of porcelain or gold needs to be placed on the tooth to protect it, prevent it from breaking and restore it to full function. The alternatives available include no treatment or extraction of the tooth. Tooth extraction is preferable to no treatment at all. Letting an infected and untreated root canal is a poor option since it can lead to toothache, dental abscess formation accompanied by significant swelling, destruction of bone and allow bacteria in the mouth to enter the bloodstream and cause infections in other parts of the body. The pulp will not heal of its own once it has been infected. It is wise to consider all of the implications of losing a tooth before having it removed. The only cases that tooth extraction may be recommended instead of an endodontic treatment is when periodontal health of the tooth is poor or the tooth itself is unrestorable and not enough tooth structure left to support the final restoration. If the dentist confirms that there is enough tooth structure to restore the tooth, endodontic treatment is always the best decision compare to dental extraction. When a tooth is missing, its neighboring teeth will tend to shift to the empty place. Losing even a single tooth can lead to problems with temporomandibular joint function, destabilization of the biting system, and esthetic changes in the profile of the face. Dental implants. This restorative treatment involves a surgical procedure to insert a small titanium fixture that serves as the replacement for the root portion of a missing natural tooth, a healing phase of several months, and a final restorative phase, which is similar to having a single tooth crown. Dental implants could last ten to fifteen years or more, depending on how well the implant is cared for professionally and at home, but with proper care, implants can last a lifetime. Unfortunately, not everyone is a good candidate for implants. Fixed dental bridges is a dental restoration used to replace one or more missing teeth by joining permanently to adjacent teeth or dental implants. A pontic (false teeth) is attached to adjacent natural teeth with metal and plastic connectors .The cost of dental bridges varies depending on the type of bridge selected and the area of the country in which the procedure is performed. Bridges could last ten years or more with proper care of oral hygiene. A removable partial denture fills in the space created by missing teeth. These appliances restore function and esthetics and can be inserted into the mouth and removed at will. On average, partial dentures may be expected to last about five years. Depending upon circumstances, it may last a shorter or longer time. After considering all of the consequences of extraction and all of the alternatives for tooth replacement, in most situations it becomes obvious that well-performed root canal treatment with a prosthodontic restoration is the best treatment of choice. 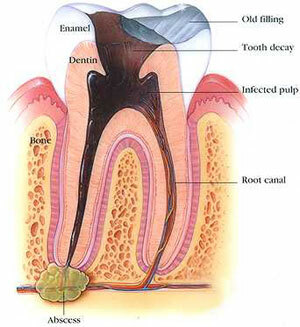 Although the pulp is removed, the treated tooth remains functional. Remember that natural teeth are more effective for chewing and biting than artificial teeth.